Welcome back to CASEing The Catty Blog Hops. I am going through a very masculine phase at the moment. Not sure why because I really love flowers & bright colours. 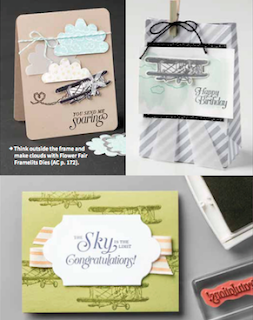 Today I've chosen to case a mixture of all 3 of the Sale-A-Bration Sky Is The Limit cards. Here are the cards I am case-ing. I know how vague that sounds but let me explain. I wanted to use the brown from the top left card, the plane & sentiment from the bag & the label from the bottom card. I was looking for a project for my stamp club ladies & stumbled across a Partial Die Cut Label Closure card on Pinterest. It was based on one originally by Linda Heller & was perfect for what I was trying to achieve. 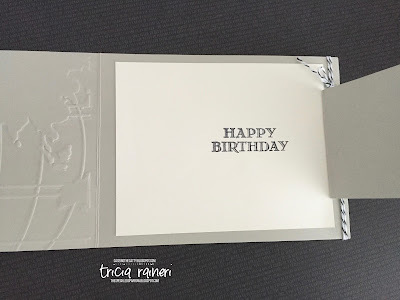 I also wanted to incorporate the World Traveller embossing folder & show the technique of inking up the folder when embossing. I used the Happy Birthday from Guy Greetings for the inside. You could leave it blank as the label flap covers this area. Creating this type of card involves only partially cutting the Label framelits 1" in from the right-hand edge to create a flap. I also scored this flap so it folds easier, but you don't really need to. Thanks for hopping along with us today. If you would like to go back to Bronwyn, then click previous blog below. To keep moving forward, be sure to click the NEXT blog button to see what the lovely Rachel is sharing with us today & to continue the hop. That's a tricky card, Tricia. I bet your class loved it too. You've used a great selection of techniques to showcase the little bi-plane. Wow the combination of the Going Global paper and folder are fantastic with the plane!! Thank you for the inspiration!! Great card. What a fabulous masculine card, Tricia and I love the partial label die cut. Will have to give that a try. I love cards with different folds and your's is fabulous!! Great boy card!! Great fancy fold Tricia! It's always nice to see new ideas, especially when they include some masculine design too! I always like to be inspired by different fancy fold cards and you have not disappointed me today. 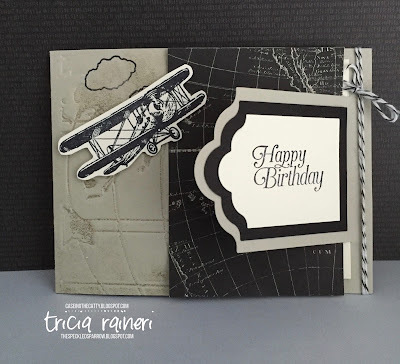 Love the embossing folder with this stamp set, it just goes so well together. Love a good card fold! Thanks for sharing the deets. CTC62 Time For A Sale-A-Bration!